A rich and meaty sausage with onion, parsley, cracked black pepper and sea salt. Our beef comes from cattle from registered pedigree Aberdeen Angus bulls. 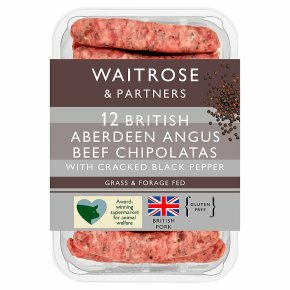 INGREDIENTS: Aberdeen Angus beef (80%), water, onion, pea flour, potato starch, salt, pea fibre, black pepper, dried parsley, preservative sodium metabisulphite, nutmeg, white pepper. Grill Time: 12-14 mins. Grilling Instructions: Preheat grill. Place under a medium grill. Turn during cooking. Pan Fry. Time: 10-12 mins. Medium Heat. Heat 1 tbsp oil in pan. …Add chipolatas to pan, turn during cooking. …Drain well before serving.